This elegant and secluded four-star hotel still retains its original features dating back 100 years. The quiet and restful atmosphere is ideal for adults seeking an insight into a Spanish town hidden away from the holiday resort atmosphere. My husband and I wanted a relaxing get away from it all break and we cetainly got that here. The hotel is beautiful and the grounds are outstanding. Cleanliness was good and the staff are pleasant and helpful. The food was excellent but a bit repetative, and drinks were available all the time. The entertainment we found a little strange as the new manager there will not let the entertainment staff advertise what they are doing, so unless you find someone who knows about it you will not know what is going on. We also found out that the new manger is now trying to cater more for the Spanish in the hotel rather than English, although this is not a problem as the English are still treated well. We would deffinately visit this hotel again as we were so relaxed there. Your every need is catered for and there is even a library with English books if you forget your reading material. Hotel setting makes you feel you are in your own little oasis with beautiful grounds and although renovation works are still going on they did not intrude on our stay. This did reflect on the cleanliness and we were disappointed that our room was not hoovered throughout our two weeks stay. The food was plentiful but quite repetitive, its better to eat early when the food is hot! Be prepared to take a back seat when the Manager has booked conferences and weddings. Entertainment was restricted at these times but Millie the entertainments organiser is a GEM she will make your stay special. We were made aware that this new Manager is not keen on all inclusive and this facility may stop at the end of the year. What an experience! The only thing that let us down was the weather, it was overcast most of the time. It was worth the money just to people watch. Saturday night is when the local gentry come out to have their weekly dance, what a spectacle. Some building repairs were ongoing at the time of our visit which reflected in the cleanliness, but the works are completed the place should look a million dollars (I did hear that Royalty was visiting in August). Food was always fresh with plenty of choice (and the wine (red, whit & rose) was freely available on the pump! The hotel is situated on the main coast road next to the port, but this was not a problem, it all adds to the character of the place. Staff were more than helpful, even the manager mucked in and he was very approachable helpful. Millie & Lillie were responsible for our in house entertainment which was the normal quizzes and hotel sports but Millie was also a very accomplished dancer giving us personal a show of the Cabaret chair dance, great stuff. Entertainment is excellent, especially as it is done by wan who is the best. The Hotel is very unusual, over 100 years old with many original features. 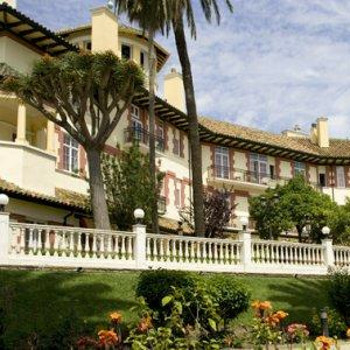 it is set in 29 acres of gardens overlooking Algeciras port and Gibraltar. It is well worth the visit. The rooms have antique furniture and old carpets but this sits very well with the atmosphere and it is very clean. Every room is individual in style, our room had high celings, and french doors opening onto a small balcony. The bathroom also had french windows and was huge.The dining room is modern and the food excellent. If you can speak a little spanish you can get some practice with the staff, they have a lot of patience and will even share a joke with you. The animation team are very friendly and twice in the week there was a professional show (flamenco etc). Guests were mainly english, however business people also stay there. The beach is 30 mins walk away, however the pool at the hotel is set in the gardens and is lovely. There were very few young children, it is an adult holiday and very much centred around the hotel, with activities day and night. The weather during the first week of May was bad, showers every day, but we stayed all inclusive and made use of all the facilities. We had a late deal with first choice which was excellent value. We were originally based at Cortijo Blanco in San Pedro which we found to be great for children but not what we were looking for as a couple. We managed to upgrade free of charge to Reina Cristina to try it out as we felt we had nothing to lose and it was also had 4 stars. When we arrived at the hotel we were given a key to our room, which we found to be small and in the basement of the hotel .... but we felt that it didn't matter due to the length of time we would be spending in the room. When we had unpacked we walked around the hotel and gardens which were beautiful and very clean. The hotel in itself was very clean but could do with some repairs here and there, but nothing major that would put us off returning in the future. We went to bed that night thinking "GREAT" .... but i never slept due to an air conditioning vent or fan that was outside our door and it's whirring kept me awake all night. Next morning i went to the reception and complained and told them that i could not spend the rest of my holiday trying to get a decent sleep, but that was short lived as they moved us later that day without any hassle at all. The hotel was a short walk form shops and bars, and also had a small bus service that would take you back and forward to the beach for the various watersports on offer. The hotel never seemed to be overcrowded and there was an indoor pool and 1 outside pool, where you could easily get a sun lounger without the tugging & fighting that we have experienced at other hotels. Sun loungers could also be placed within the beautiful gardens which was great if you needed shade during the day. There were mainly adults at the hotel, with a few sprinkles of children here and there. We found the entertainment to be good as there was always something to do day and night. The hotel staff were very friendly and polite, and we found the entertainment staff put on a variety of shows. disco's etc. We were on an all inclusive basis and the food was great, which also suited me as i am vegetarian. We never had a problem with ordering more than one drink each ..... which we have also had to endure in the past at other hotels. You can have picnic lunches made up for you, which are free, to take to the beach or for day trips that you have arranged, you just had to place a request form into the hotel the night before and you picked it up in the morning. We would definetely return to this hotel and know of a few freinds that have returned ..... BUT if i am being totally honest .... i do not think this is the greatest holiday for children, although it does cater for them. We went on a trip to see the monkeys on Gibraltar Rock which was entertaining ..... but we had a bit of a wait at the border before we could get of the bus. We also went on the boat trip to see the dolphins, and for once i was not sea sick. If you are looking for a relaxing holiday in beatiful surroundings, with goos food and drink .... then this is the place.